Hexagonal Picnic Tables - Picnic Table Store-Commercial grade quality-lowest price. Hexagonal picnic tables make a great selection for your park, school, or food court. Our hexagonal picnic tables feature six sided top with attached seats. Hexagonal picnic tables are popular in schools and for business meetings as the shape promotes interaction. This is ideal for taking your corporate meetings outside on a nice day. 46” Wheelchair Accessible ADA Hexagonal Picnic Table, 170 lbs. ADA Compliant Wheelchair Accessible Hexagon Recycled Plastic White Picnic Table with Attached Benches, 253 lbs. 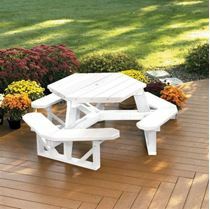 Hexagon Recycled Plastic White Picnic Table with Attached Benches, 212 lbs. ADA Wheelchair Accessible 41” Hexagonal Recycled Plastic Picnic Table, 316 lbs. 41” Hexagonal Recycled Plastic Picnic Table, 354 lbs. Hexagonal Picnic Tables for Sale! Our recycled plastic hexagonal picnic tables are built to out last wood picnic tables. Buying a hexagonal recycled plastic picnic table is the responsible environmental choice. The benefits of a Recycled plastic picnic table rather than any other material is that is doesn't peel, splinter, or rot! Recycled plastic is impervious to weather conditions making it the perfect table year round. 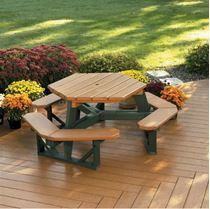 Click here to see a video for assembly instructions for the Hexagonal Picnic Tables!